Every animal handler or hope-to-be trainer needs to establish a relationship that allows the animal to understand them and figure out what they are asking them to do. The best and most effective system must be based on trust. The obedience or compliance we are looking for flows from that trust. The basis for a horse trusting you is that everything you do is routine and usual. There’s never anything sudden or startling going on. And the way you start that feeling in the horse is by doing everything you do around him in a rhythmic way. In my early training days, I was taught that the first thing a real trainer did was to gentle a horse. You proceeded to do that by tying the horse up somewhere and sacking him out until his skin stopped jumping when you whopped him with the sack or blanket or whatever and he stood there and accepted it. The problem with a system like that is it doesn’t teach the horse what to do. Instead of being positive, it’s negative. It teaches the horse what not to do. If he keeps flying around at the end of the rope, he’s going to get hit again. If he stands still, the sack will go away. If you grab the handle of a hot pan, it doesn’t take you long to realize your mistake. Your body reacts to the stimulus and you let go of the pan. You learned not to pick up a hot pan but since you didn’t really have time to process all your options, your learning isn’t very complete. Just like the horse getting “gentled”, you got a negative education. You learned what not to do, what to be afraid to do. If you had had the time to process the situation, you might have gotten a more positive education and learned the way to pick up a hot pan so you wouldn’t get burned. 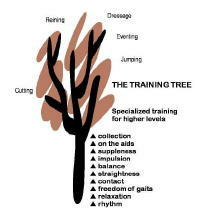 Rhythm is at the bottom of the training tree because that’s how you get it all started. If the horse is not worried, not wary of sudden things or unsure of what is going to happen next, then you are starting to create a relationship built on trust. From the minute you come in contact visually in the pasture or by his hearing your footfalls or your voice as you come down the barn aisle, you want to be doing everything rhythmically. Steady footfalls, steady movements open a gate or door, everything steady and even to convey a feeling to the horse that everything is going to be consistent and predictable. You can start to judge whether you’ve got rhythm by paying attention to breathing, both yours and the horse’s. Paying attention to your own breathing can help you stay rhythmic. If you hold your breath, you’ve lost it. Paying attention to the horse’s breathing will tell you if something you’ve done has startled the horse because anything unrhythmic will interrupt the horse’s breathing. If the horse startles and catches his breath but you can keep from catching your own breath, you will keep the rhythm going despite the circumstances. Gradually the horse will figure out that if something startles him, you’re a good spot to come back to because everything around you stays rhythmic and predictable. You’re a safe place. A lot of people can stay rhythmical while their catching their horse and grooming their horse but as soon as they go into training mode, they starting using sudden moves to gain control. To train a horse, you have to interact with him, not interrupt him. For example, a lot of people think the best way to stop a baby male horse from biting while you’re working with him is to just keep pushing his nose away anytime he tries to take a nip. But that interrupts whatever else you’re trying to do with him at the time and pulls you into his game. Instead, you just put a flash or a drop noseband on him and stabilize his jaw so he can nibble with his lips but he can’t bite. Now you just go about your business and when he swings around and nibbles, you just ignore him. You don’t react, you don’t break your rhythm, and pretty soon the game gets boring and he quits. Whoever controls the rhythm controls the movement. A lot of beginners can be rhythmical on the ground but once they’re in the saddle, they tend to hold their breath and react when they get frightened. If you hold your breath, your body locks up. You need to become self-disciplined enough to maintain the rhythm under any circumstances. If a horse startles or spooks when you’re riding him, the best thing you can do is to ride him calmly and quietly forward with as little interruption as possible. When you’re training a horse to be rhythmical, you listen to his footfalls. The order of his footfalls, regardless of which gait he’s in, should be even. Horses lose their rhythm when their backs are tense or their riders use rein aids that are too strong or driving aids that are too strong. The walk should be a four-beat march, the trot has a two-beat rhythm. The canter has three beats. In the beginning, a trainer just rides whatever rhythm the green horse offers but as the horse progresses, the rider’s seat sets the rhythm he or she wants the horse to move in. Playing music in an arena helps a lot of riders and horses pick up a rhythm. Walking and trotting over cavaletti can help a horse develop rhythm. Walking over uneven ground or up and down hills are other exercises a trainer can use. The games we eventually want to play with our horses all involve some test of rhythm. Dressage is a game of maintaining rhythm with varying degrees of strength and stride length. Reining involves riding a lot of circles with varying rhythm. Whatever your goal, rhythm is always going to be at the foundation of the training you need.